Camryn Calcagno presses in earbuds,clicks up the volume on her iPhone, and stares into the horizon of The Bridges Golf Club, where Mt. Diablo rises in her field of vision. With a bucket of golf balls spilled out at her feet, she begins driving each one toward the mountain. What's the soundtrack for such focus? "Hillsong," she says with a smile. 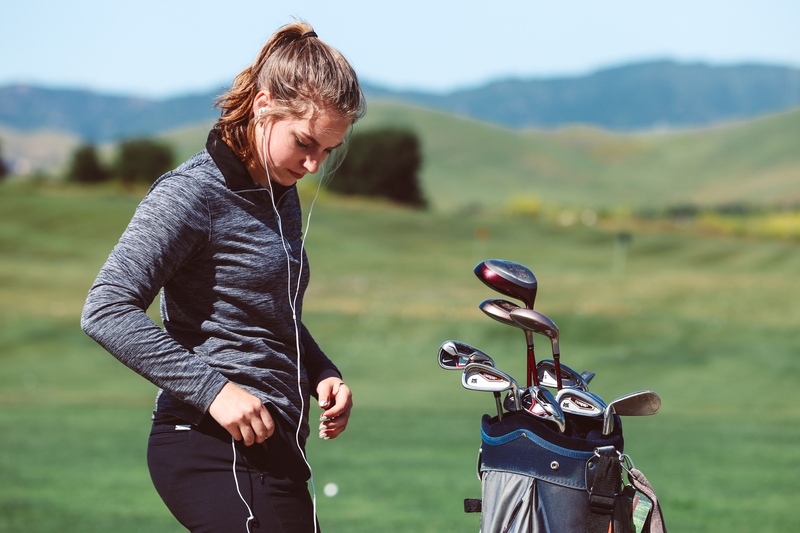 But the freshman — and varsity golfer — at California High School is just getting back on the greens after five months out recovering from bone-correction surgery and an ensuing infection. Camryn was born with a bone in her foot not quite aligned with the others. Throughout her childhood, which was filled with dancing and other athletics, she always had to compensate for the pain. Sure, bunions might be common on golf courses, but not when you're only 14-years-old. "Playing golf, where you're walking for hours and hours, was really starting to become an issue and really affecting her quality of life," said Camryn's mother, Alecia Henderson. "It was really an honor for her to be picked for the varsity team as a freshman, so she made the varsity team and she played well and we planned to have the surgery after the season was over." That was it. Three weeks over Christmas break would provide enough recovery time and she'd be back to school for the second semester in a walking boot. But during her three-week, postoperative checkup, her foot didn't seem to be healing as expected. "It was like a huge blood blister," Alecia recalled. Camryn's doctor immediately suggested she begin homeschooling, and a second surgery to clear out the infection was scheduled. "I didn't go back to school, I got the second surgery, they had me on a PICC (peripherally inserted central catheter) line with medicine going into my arm three times a day and it would take an hour for it to filter through," Camryn said. "I would go to the hospital six days a week for this oxygen treatment, and I'd lay in the tank for two hours. You know when you go up in the airplane and your ears pop? It's like that." A teacher from the school district was sent out to Camryn's home during the week, and a home-care nurse also visited to assisted with the PICC line and the "wound vac," a machine attached to Camryn's foot for keeping the wound clean. Alecia specifically remembers when the wound vac was put on for the first time, and how hopeless she felt watching her child in pain. "It was so much all at one time, but she was such a trooper, even through the pain she was handling," Alecia said. "I was so proud of her. I think that was probably the first time I'd seen her strength, that core who she was." As her body fought the infection, Camryn didn't get very many visitors, especially during the peak of flu season. And she's also not allowed on social media. "I don't know how she handled that spiritually," said Alecia. "It was very isolating, feeling so left out of her friendships and so left out from not being in school for three months." "It was very isolating, feeling so left out of her friendships and so left out from not being in school for three months." While Camryn was a Christian before her surgery, she admits it was difficult to consistently spend time in God's Word. But with so much time to spare over her five-month recovery, her journal of prayers and scriptures is now full of Camryn's neat printing and yellow highlighting. It was one particular moment during her recovery that Camryn said she finally understood the importance of God's Word. She was alone, listening to the sound of the wound vac on her foot, and she was frightened — weighed down with worries and questions. Then Camryn said she remembered something she'd heard from a CD of sermons she'd once listened to: "The devil will distract you with unbelief and doubt, fear and not trusting in God's Word." "God's Word is medicine for my flesh," said Camryn. "That was the time it really opened my eyes and hit me in the face: 'You need to start reading the Bible, kid.'" So Camryn started searching through scripture, looking for more of that 'medicine' with prayer and encouragement from her grandmother. And what Camryn found was God was right by her side during the entire situation. "Even though I was alone a lot of the time, I was always with God," said Camryn. Isaiah 40:28-31 became a mutual comfort to both Camryn and Alecia. "And Romans 12:2 — 'Learn to know God's will for you which is pleasing perfect and good' —which I really like too because what was happening wasn't 'pleasing, perfect, or good,'" Camryn added with a dry laugh. While moments could grow tense or strained over the months, and while the whole ordeal was exhausting for the family in the moment, Alecia said it was actually sweet to spend time with Camryn in car rides to the hospital or while they were home together. "Bonding through conflict" as Alecia said, sort of like a bad, family camping trip. And it was made possible because God was present for both mother and daughter. "You really do feel that extra hug, the comfort that only the Holy Spirit can provide," Alecia said. "And I believe He met her and He met me in those times and was faithful. And we definitely can see how he worked through that whole situation." As she spent more time focused on God's Word, Camryn said her faith was strengthened. Now her foot is being strengthened, too. "Getting out on the golf course was something I was really working toward, getting full momentum in my toe again," said Camryn. "It's still going to take time to find all the good out of what's happened. But also if it had never happened I don't know where I would be with God."